Partially fragmented, the long ridges of this mammoth tooth once ground grasses and sedges much like cattle do today. In January, we looked at rocks from our oldest collection. Today, we explore the Museum’s newest fossil: a fragment of a locally-discovered tooth that belonged to a Columbian mammoth. Not only is this an exciting specimen for the Museum’s Collections, it also brings into the public sphere another piece of what local paleontology expert Frank Perry describes as the “giant jigsaw puzzle” of paleontology. The tooth is about the size of a half-gallon of milk. On its crown you can see ridges that would, some hundreds of thousands of years ago, grind grasses and sedges much like cattle do today. Mammuthus columbi was primarily a grassland grazer. These grinding teeth grew in sets of four, and were replaced several times throughout the animal’s life, just like in elephants. Its enamel plates are slightly tilted, which helped to keep the teeth sharp as they wore down. The Columbian mammoth was one of several mammoth species that lived during the Pleistocene, about 2.6 million to 11,700 years ago. It would have appeared in North America about one million years ago, where its range stretched from Canada down to Nicaragua and Honduras. In contrast to the thick coat of its relative the woolly mammoth, the Columbian mammoth probably did not have much hair. 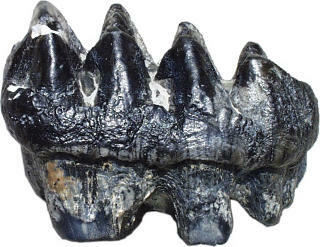 Notice the more pronounced cusps of this fossilized tooth from a mastodon, a distant cousin of the mammoth. This difference helped mastodons to feed on woodier plan material, like trees and shrubs. They stood up to 14 feet high at the shoulder and 13 to 15 feet long, with tusks up to 16 feet long. These animals may have weighed between 18,000 and 22,000 pounds, just under the weight of a school bus. 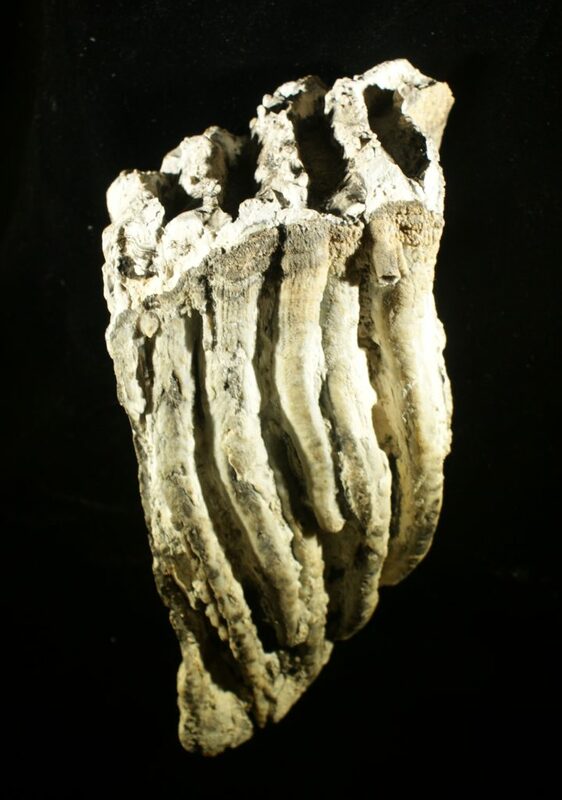 Compare a tooth from a mastodon’s skull to this mammoth, and you’d notice higher cusps: an indicator that mastodons ate woodier shrubs and trees. Our newest tooth was given to the Museum by longtime friend Frank Perry. In a recent email titled “Mammoth Puzzle,” Frank wrote to say he received a piece of tooth that was collected several decades ago at an excavation in Watsonville, and could it be the missing part of a similar tooth from the same area, already in the Museum Collections? Here he was referring to the 1973 discovery of a Columbian mammoth tusk, a whole tooth (weighing a whopping 10 pounds! ), and a smaller tooth fragment. With great excitement, we scheduled an appointment to compare the two partial teeth to see if we indeed had a match. Fortunately for us, Frank Perry loves to share. He sat down with us to offer some of his personal history studying Santa Cruz County’s fossils, and that includes several mammoth finds over his career. Often these discoveries have been teeth, which are so huge and durable that they often outlast the rest of the animal’s body. It’s fairly common, Frank says, for these discoveries to happen at construction sites or coastal cliffs, or any place where ancient sediments get exposed. And while our two teeth were not a match, we weren’t wrong to hope: Frank points out that in the history of paleontology, after someone finds a fragment, it sometimes takes “50 or 100 years before a fossil is found that shows what the rest of the animal looked like.” Paleontologist Charles Repenning, for example, found the remaining parts of a fossil pinniped — a relative of modern sea lions — more than half a century after the original fragment was discovered. Part of the reason these mammoth teeth are so cool is because most fossils found in Santa Cruz are marine. Many people have found seashells, whale fossils and pinniped parts. However, they’re also interesting because they represent the contemporary set of large animals, or megafauna, that lived during the Pleistocene. Mammoths and mastodons weren’t the only megafauna to stomp the landscape — camels, giant ground sloths and saber-tooth cats also roamed North America. To learn more about the Pleistocene Epoch and its animals, check out the University of California Museum of Paleontology. For those who still wonder how the Museum’s new tooth — and paleontology in general — might matter to their lives, Frank makes an excellent case for the joys of exploring the deep past. “Everyone is curious about their own genealogy,” he says. “Paleontology is nature’s genealogy.” Whether learning how changing climates have shaped our lands or tracing evolutionary relationships between extinct species, paleontology can tell us more about how we came to be. And one way to fill in the gaps of our past, Frank says, is careful observation.